Tenerife living Berta is a legend of retirement overseas. Tenerife living's best part ended for Berta while on retirement overseas. Tenerife living on retirement is very much loved by many foreigners. Elderly German Berta was living proof of it. Before moving to the topic Hogar Santa Rita I will tell you about below, let me remember Berta's better days on the island. She used to hang out for hours in a cafeteria (café) by Puerto Cruz Tenerife North. She read her daily German newspaper in this spot and she took her meals there, except on week-ends. Then, she usually was invited out. She almost belonged to the inventory of this bistro. She loved to sit there facing the road where she could see everybody walking past because, the whole six meter wide front of the café always had its doors open that took up the whole width of the large room. All foreigners knew her. Many didn't speak German. Most of those pensioners never even learned to speak Spanish which isn't ideal for Tenerife living. She had eight kids before she opted for Tenerife living. She was the proud grand mother of many grand children. However long time ago, she stopped going back to her home country. Relatives had to come to see her. She had never been ill for a long time, while in Tenerife. She had a couple of operations for cataract, as is normal with the elderly. She most probably had them at the General University Hospital in Santa Cruz. One of her daughters who took her out on Sundays helped her to get a denture. Berta's life on the island brought her no luck with the denture. It wasn't very stable which may have been the dentist's fault. Anyway, Berta's many offspring and war times took their toll, as well. Why? Chronic lack of calcium was the result of it. This isn't the best base for old fashioned false teeth. Elderly Berta had a Spanish boyfriend half her age. Berta used to tell all the ladies that he took her out for drives on Saturday afternoons. Often she made up stories about it and became the laughing stock of the whole suburb. What she told was rather unrealistic. Anyway, life on the biggest Canary Island kept her from boredom. So did changing her rented accommodation a couple of times because she never had her own 'holiday home in Tenerife'. Suddenly, Berta was gone. I found out that her daughter had her admitted to the retirement home Hogar Santa Rita . Berta who had always been a rather difficult person had been diagnosed with Alzheimer's disease. The 'Santa Rita Hotel' for the poor is huge. It was founded by the Catholic father Padre Maria Hernández Hernández who had much talent for collecting private donations. I don't know if the Cabildo Government of the island helped with subsidies. There are two Santa Ritas. A modern one exists also. Its huge square building has become the pink and white landmark above Loro Park in Puerto de la Cruz. The Santa Rita even has indoor pools with jacuzzi. Elderly Berta has an exceptionally high pension. It allowed her rather luxury habits of Tenerife living. Those good old days were not the same when Pesetas were discarded. However, Santa Rita will also admit you when you are poor. They take whatever pension you have, I've been told. This would be fair as Santa Rita also admits the disadvantaged. Mind please, that Santa Rita is giving many services to improve life for its inhabitants. At least, now Berta is having proper medical care in house. The daughter takes her out on Sundays or Saturdays. Please, note that the name of Berta is fictional to protect the real person's identity. 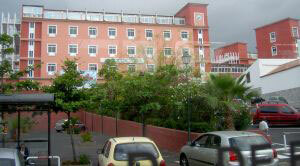 Dr.E.Royo is said to be a capable doctor for the eyes in North Tenerife. Why it's good to know Dr.Michael Theis for the north as well as for the south of Tenerife.